We pride ourselves on being able to adapt to a project. We do not hold to a specific style, instead we connect with our clients to craft a design to suit each commission. A process of designing, prototyping, testing, then revising, allows us to create innovative architecture which our clients can tell stories and thrive within. Bespoke is beautiful. A well-designed interior environment can make measurable improvements in well being . Residential clients can benefit from the marriage of materials that are warm and soft to the touch. For businesses it can be a catalyst for improving culture, collaboration, recruiting and retention. At teArchitecture we understand the importance of the interior as the place where the life of the occupants meets the architecture. Therefore we pay close attention to the quality, color, & texture of interior materials to ensure that they create a seamless transition from an exterior to interior architecture, reflecting the both sensibilities of the client and the project. Architecture has the ability to inspire and connect in the everyday. However at teArchitecture its a timeless, lasting beauty that we choose to pursue, not the latest ‘look’ or fad. We’re committed to sensitive contemporary design that responds to today’s lifestyle. So whether you’re going after your dream home, seeking workplace or spatial planning, or refurbishing your restaurant or business, our design-led, collaborative approach means you’ll achieve results that are tailor-made to fit. After the time and effort that we put into the design process and construction documentation, it is a vital service to represent the client throughout the construction process in order to ensure that the construction is executed in strict adherence to the project's design intent. At teArchitecture, we offer construction administrative services that aligns the design strategy with the construction process. teArchitecture helps our clients keep their construction projects running smoothly and on schedule through construction administration services. 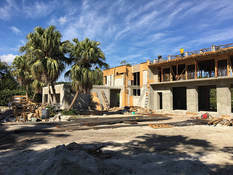 We provide support to the construction manager, general contractor, and owner during the construction process by assisting in interpreting technical documents, leading/coordinating with the consultant teams, responding to RFI's, checking/processing shop drawings, and visiting the site during construction to observe construction status. We are proactive in our approach to help reduce potential conflicts during the complicated construction process.